Are Low Crude Oil Prices an Opportunity for Shipping Industry? Drastic drop in crude oil prices in 2015 brought lots of expectations and anxiety on shipping industry actors. Offshore traders of crude oil expected market slow down, labor lay off, while freighters looked forward increased returns and new opportunities. Indeed considering technological transformations after severe rise of oil prices in 2004 called to minimize usage of fuel in order to cut expenses now became an opportunity for profit. Expectation is that drop in crude oil will cause drop in marine fuel prices, thus causing more returns was true in some cases. Shipping companies lowered their costs attracting more customers without losing their profits. Moreover, an opportunity to open new routes arose. Being not cost efficient before, long-distance low trade routes were left out of attention. Given lower fuel prices, efficiency of this routes rises as the cost of servicing them drops. This particular event boosts the trade and opens up more possibilities for producers to deliver greater customer value to the places they could not reach easily before. Nevertheless, relation between the crude oil prices and the fuel prices is not as straightforward as it seems. 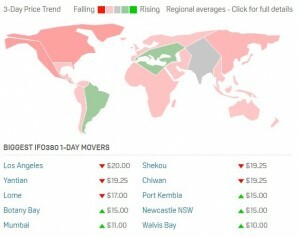 Bunkerworld Community follows up the fuel prices movement and admits that the pattern of pricing differs around the globe. While some marine basins experience decreased prices, others face rise in fuel prices. It is mainly due to the drop off in activity of oil traders that find producing and trading oil products in some cases inefficient and merely profitable. Considering that shipping oil is not cut out for profits in those regions, oil companies decrease trade volume for them, causing prices to raise in that regions. Moreover, catching the wind of opportunities for establishing new routes might be a slippery slope for shipping companies. In case of rapid rise in oil prices, the fuel prices might jump up severely causing huge losses and even forcing companies out of business. Being vulnerable as it is relationship between shipping industry and crude oil production might become an opportune moment for companies to come out of shade or drown in competition.